KIEV, Ukraine -- Students in Kiev release YouTube video for their Moscow equivalents speaking out against ‘rampant Kremlin propaganda’ they say fuels the conflict in eastern Ukraine. A group Ukrainian students have taken to YouTube to warn their Russian counterparts about ‘rampant Kremlin propaganda’. This is the advice handed out by Ukrainian students to their Russian counterparts via YouTube, in a bid to tackle what they call rampant Kremlin propaganda. 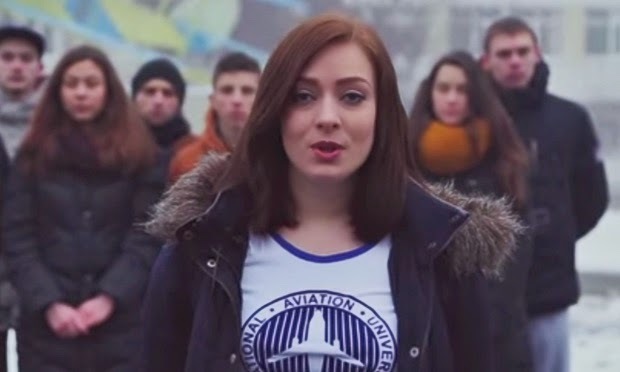 Students from several Kiev universities collaborated on the video, which urges Moscow students not to believe state-controlled media reports about Ukraine or Ukrainians. The video, uploaded yesterday, has already been watched 649,000 times and attracted over 11,000 comments. Kiev student Yevheniy Melnik, the man behind the video, says Ukrainians are tired of the way Russian media portrays them as victimising Russian-speakers in Ukraine. Russian media has previously accused Ukrainian soldiers of crucifying a three-year-old child and described pro-European protesters in Kiev as neo-Nazis. “A war is going on in our country. Your soldiers and our soldiers are dying in our country, civilians are dying,” a clip from the video says. “We stand on opposite sides of the barricades, and between us lie kilometres of misunderstanding,” it continues. Melnik says the video is trying to challenge misconceptions which are further pitting the countries against each other as Kiev battles a pro-Russian insurgency in the east of Ukraine. “These are ordinary students who are trying to somehow put an end to this information war,” Melnik told RFE/RL. Melnik says the four-minute message was not a government project but produced entirely by students. It reflects their feelings as the “strength and the future” of the country, he added. The video goes on to counter claims from Russian-state media that the Euromaidan protests in Kiev were a US funded coup. Instead, they say, last year’s protests were held to denounce the “total corruption, complete rejection of European integration, media censorship, and police lawlessness” under then-president Viktor Yanukovych. It also accuses pro-Russian separatists of forcing many in Crimea “at gunpoint” to vote in favour of joining Russia. “We – or, rather, the leaders of our countries – are the only ones to blame for our problems,” they say. The reply from the Russian Students was the most Scripted garbage yet from the Kremlin. Hopefully some students will see the Ukraine video and begin to see what is really going on in Ukraine.